In this short video by Natalia Stürz, the image becomes a means to an experimental inversion of the perception of places, reflecting on stereotypes. 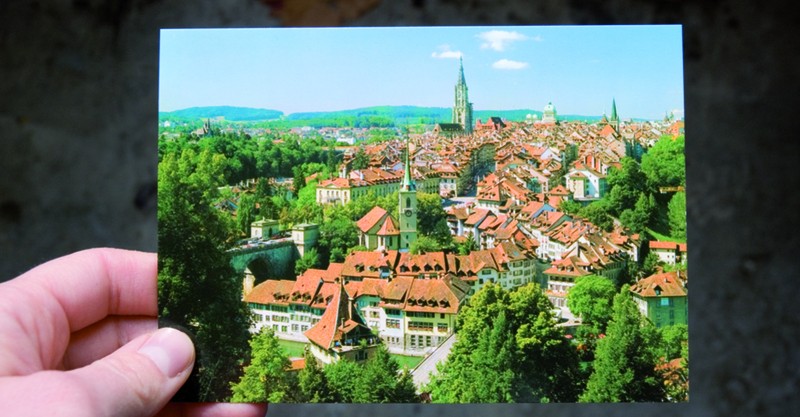 At first the video shows the still picture of a place of touristic importance (the old city center of Bern), daily noise as a backdrop to what we see. Then something happens to clarify the subverted viewpoint. The paradox here is that a real place might become "a picture of a picture". Natalia Stürz explores in an unconventional way how places that are "worth seeing", mainly touristic locations, eventually convey a distorted image of themselves due to the thousands of postcards that depict them and the photographs taken by tourists which are all alike.